Energetics, kinetics and dynamics involved in formation/growth/reaction of low-dimensional functional materials and the materials’ novel properties studied using computational and experimental approaches. The theoretical and computational approaches adopted include optimization algorithms, molecular dynamics simulations and Monte Carlo methods, based on multi-level theories ranging from molecular mechanics, semiempirical theories, to first-principles theories. Recent research focus is on nanoscience, including interactions of nanomaterials with chemical, biological, and medical systems, aiming at promoting the applications of nanostructured materials in energy-related and chemical, biological, medical, and environmental areas. Developments of related theories and methodologies. Member of Editorial Board of Journal of Theoretical and Computational Chemistry (JTCC) since 2007. Member of Editorial Board of Journal of Cluster Science (for a three-year term beginning January 2014). Member of Advisory Editorial Board of Chemical Physics (for a three-year term beginning November 2014). Member of Editorial Board of Scientific Reports (for a two-year term beginning January 2015). 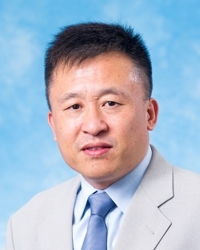 Associate Editor of Journal of Electronic Materials (for a two-year term beginning February 2015).